EXCELLENT VOLTAGE REGULATION: This UPS provides highly stable output voltage in Backup mode with all type of non linear loads, like SMPS / Inductive / TFT etc. NO LOAD SHUTDOWN: In case No load is connected to the UPS, it will sense the load condition and automatically Shut Down after 3 minutes to protect unnecessary discharge of battery. Hence increases battery life. 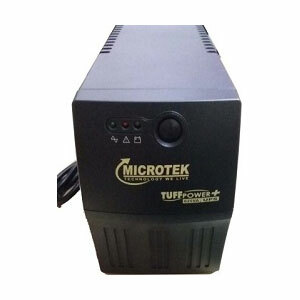 Inverter/Generator Compatible: This Microtek E² Series UPS has been designed to work with Inverters and Generators. 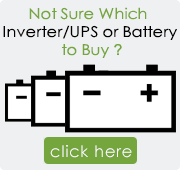 This UPS will consider the input from Inverter or Generator as mains and keep providing Extended Backup to the computer, without discharging its own battery. FAST BATTERY CHARGING: This UPS utilizes unique FCBC Technology, which charges the Battery in less than 5 hours, in order to keep your UPS ready immediately for next emergency. Extended AVR Range of 140~300 volts: When the voltage fluctuates within this AVR range, this UPS gives you voltage output of 230 volts and doesn't switch the UPS to Battery Backup mode. Over Load / Short Circuit Protection: If the UPS is excessively overloaded in backup mode or encounters a short circuit, it will go into protection mode. The output will be shut down in this case and warn you to correct the load condition.